Yes, yes, yes, yes, yes, yes, life is good, but not only good this year, it is going to be my year. I have lived for 12 years and 10 months with one question continuously creeping around in my brain. "Where is the Internet connection?" Did you know there is a new wave, a new trend; there is a new "buzzword" you can drop at cocktail parties and with groups of yuppies. The phrase is called "location independent" it is lifestyle, it is gear, and way of working. It is having a mobile office that is independent of one location. It is living like Andy Graham of HoboTraveler.com has been doing for almost 13 years of his life. I think we can and should credit the promoter at the expense of the truth writer Timothy Ferris for this new "buzzword." "I am working location independent." I do not know New York, or Las Angeles, I believe this phrase is already out of vogue there, however in my home state, I am sure, I would be cutting edge "California Cool," if I said the inner circle of wanna be worldly group. Oops, I am truly Location Independent in Togo, West Africa, this is not going to work. 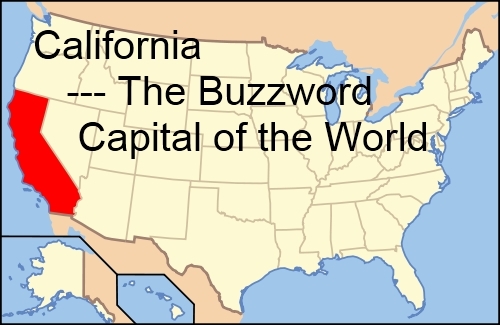 I feel people in California live, thrive and drive their lives by buzzwords; it is a place where misuse of buzzwords is the way of communicating. Here is the problem, I am 55, I am too old and set in my ways to listen and study every new trend in words. I am not part going to read "Tweets" on "Twitter.com" with the intention of finding new "buzzwords." Thought-control via intentional vagueness. In management, by stating organization goals with opaque words of unclear meaning, their positive connotations prevent questioning of intent, especially when many buzzwords are used. To inflate the trivial to importance and stature. Hmm, I think the goal of people who use Buzzwords is to increase their personal importance and stature at the expense of truly understanding and education. As with all Buzzwords, this phrase is meant to be vague, it is almost slang if not for the fact the two words have literal meanings. These two words together are buzzwords, but we can separate and understand their true meaning. Location Independent is when a person lives and works independent of a specific location. My rendition of the history of this word is this, Timothy Ferriss wrote the book, "The 4-Hour Work Week." "The 4-Hour Workweek: Escape 9-5, Live Anywhere, and Join the New Rich"
This title than spins out into the words "Location Independent." and a few smart Internet Entrepreneurs pounce on the buzzwords "Location Independent," to make their 4-Hour Fortune by pounding these phrases from dreams into money on the Internet. The Internet is a place where people romanticize a subject into a fortune. Often the goal of an Internet Entrepreneur is to take a real dream, pound it with word, bend, trend, and defend the words on Internet pages until they have a social following. When they have a social following by promoting and selling dreams, they can live anywhere, they are location independent. The may have money, the rest are still chasing dreams. The first promoter wins, and you get a credit card bill in the mail to pay for the promoters sweet words you purchased. The bottom line, owning an Internet Business is the best way to live location independent that has ever been found. Moreover, Timothy Ferriss is truly selling and telling people the same old story, the same old dream. I first heard this dream and sang along with Johnny Paycheck while drunk in bars in 1977. "You can take this job and shove it "
This song is best sung while very drunk, with a group of people who like to drink more than work. This is the dream, we all want to take this job and shove it, however, there is no way to eat if we do not have money, and even though it is a nice dream, selling this dream can be irresponsible when believed by naïve people. Well, I have been living location independent for 12 years and 10 months now, and I am celebrating the year 2011. This will be the first year in my life, where I may never need to step into an Internet Café, it is the year where I declare myself Independent from the world of Internet Cafes, I am free to truly be a nomad. On this page, I explain how I work and live Location Independent, this is not some fantasy to sell a dream page, it is where I collect my hard-learned experience. However, I am happy to say, I need to re-write the whole page, I can almost throw away the map. I can now work location independent on 90 percent of the planets surface. The Prepaid USB Wireless Internet Modem is giving me freedom, in 2011; I can live anywhere and manage my internet business. I do not need Internet Cafes, and I am extremely happy to not live in "WIFI" Hotels. In the last year, I paid on average of 30 percent more to have WIFI in my Hotel rooms, my room budget was often 15 dollars per night because I had WIFI in the room. With the use of the USB Wireless Internet Modem, I can live in a great room, which is cost 5-10 dollars. I can rent a great apartment for 150 dollars per month, with no worries about Internet. Why am I so grateful? Boy Genius, my coder who is a partner and friend in India was talking; we decided it is time to hire Data Entry people. We are staging an Internet Business coup; we want to combine the best of Wiki with the best of travel writers to make HoboTraveler.com into a source of Travel Knowledge. "HoboTraveler.com, where Tourist become Travelers." This task requires the cooperation of Travelers, Readers, Tourist, Travel Writer, Coder, and paid researchers. We are going to pay the data entry to do specific research that will augment and fill the gaps, writing about essential terms that need to be learned before we have truly knowledge. My whole site, my whole world for the last 12 years and 10 months has revolved around finding solutions to live location independent. Well, there is problem in Togo, they have a 2G network, this is really too slow for a Skype.com conversation. Tim Ferriss wants people to hire "Personal Assistants" to outsource task to people in countries like India or the Philippines. Hmm, this is what we have been doing for years. Problem, we need people who can understand English; they need to intuitively understand my English spoke to them over Skype.com or Yahoo Messenger. I will interview these personal assistants over Skype.com to see if they can speak English. Location Independence has a lot of problem, but by the end of 2011, I think the world wil have upgrade from 2G to 3G to 4G and hopefully Andy of HoboTraveler.com will not need to travel to find an Internet Connection fast enough to make business calls. Making money on the Internet is possible, while a normal brick and mortar business is risky; you still have about a one in three success rate. With Internet Business ventures, I would estimate you have a 1 in 5000 success rate. 5000 people start Internet Sites and only 1 in 5000 makes enough money to live anywhere. I expect this to drop to 1 in 2000 soon because of the USB Wireless Modem will allow the world to become a workaholic anywhere until they achieve the dream. How to succeed as a location independent internet entrepreneur? First, you need to find people who truly are earning a living on the Internet, and not selling book on how to make a living on the Internet. I am in Lome, Togo West Africa, I hope this proves to you, I can live anywhere. HoboTraveler.com is now 11 years old, I have traveled for almost 13 years perpetually, I truly hope you understand, a planet ticket to Africa cost big money, and I do not live in Hotels for free. I earn enough money to live anywhere. If this is your dream, then I advise you to subscribe to Five Essential topic pages on my site by RSS feed. The secret to business success is to find people who truly are succeeding and copy until you can go out on your own. Steal my ideas, steal my thoughts, please copy and make better, I am always giving them away for free because the ideas are surrounded by advertisement thanks to Google Adsense. Hmm, maybe I forgot the RSS feed on "How to Travel Blog?" Please undertand this, Travel Blogging is horrible way to make a living, it is time sensitve, and Google punishes Blog post and will take them out of the Index. What is needed is good solid pages, that are "Evergreen," that help readers forever read, that can allow you to be of Guru status and pages that are well reseached are a resource. With links, photos and definitions, not just trendy opinions. HoboTraveler.com is not a trend, it is about showing by real stories how to travel, the tricks, hints and travel tips that allows a person to travel happy. I write the Blog as a support and Branding tool, the Blog is a loss leader, something to support, I make money off of core pages more than the Blog pages. To above poster: Those are RSS feed links. You are suppose to subscribe to them in a feed reader, not try to read them directly. To Andy: True, a changing society needs new words and phrases to meet these changes. It is funny how some at the cutting edge like to be cool and act blase about it haha, and so miss use the new words. But after the trend is gone, the backlash against it diminishes, and everybody knows what we are talking about we are only left with a new phrase. Good, we need a few more good ways to communicate this lifestyle haha. Very good Wade, you put a SEO appropriate link in the form box. I used to believe I could teach people who I make money on the internet, There is onlly about 1 in 500 people that semi-understands, but they cannot replicate, they just semi-understand the concepts. A Blog about one highly advertised product such as Smarphones could make a lot of money. A Blog that only sells plane tickets can make money. A travel blog about one country can make money. To get a readership with 100,000 readers per day, you need to have a very one subject Blog. People read travel blogs before they go on Vacation, I had readers who commented when I was in Ghana, when I left Ghana they left me because they do not care about Togo. The Blog is a form of Branding that makes Advertisers happy, they too do not understand, they are not the 1 in 500. To learn to make money by having organic search traffic is about the same as studying how to make an Atom Bomb. You can study and think you understand, but just because you understand, does not mean you can make the bomb. Although it theoretically appears possible, the reality is not the same. Your thoughts are symptico with Perpetual Travelers. Please sign up for My Hobo. You also could explains some reason why?